When my husband and I decided to get chickens, back in the spring of 2008, we thought we'd get a few good years of egg-laying out of them. If we were lucky, that is, because not that many birds make it past their third birthdays. Why not? Well, for one, they frequently get sick and die. They get killed and eaten (or just killed and mauled) by such predators as hawks, raccoons, and opossums. They fly away because you forget to clip their flight feathers and they simply don't come back. (See predators, above.) And we're just talking about hens here, not roosters, which in the sadly sexist world of chicken-keeping seldom make it past two months of age. Our three hens — Stevie, Snoop, and Tuffy — also happened to come from a breed (Ameraucana) known for brains, personality, and pretty blue eggs, but also temperamental laying habits. Long story short? We enjoyed only a few months of really good laying (one to three eggs a day) before the birds seemed to lose interest. During their first fall, the birds molted as expected, focusing their energies on growing new feathers for the winter instead of making eggs. In the spring, the egg factories got going again. But after the birds' second round of autumn molting in late 2009, the egg production never really got back up to speed. The second winter wasn't as cold as the first, so we didn't think that was the problem. Spring brought a flush of new eggs, but the chilly, drizzly weather we had far into June put, well, a damper on things. Stevie and Tuffy lost all their neck feathers, leaving them looking plucked and gangly, and Stevie (the bird who had been sick as a chick) stopped laying eggs entirely. My husband started flipping through his chicken books, wondering if our birds were diseased. Perhaps they had mites? After all, the ground was just too darn wet for the birds to give themselves regular dust baths, which would get rid of the mites. But they seemed to be eating and drinking and sunbathing (when we had sun, that is) just fine. They just weren't into the egg thing any more. As the erratic (too cold, too hot, too wet, too dry) summer of 2010 wore on, we realized that we were starting to regard the chickens with the critical eye of the practical farmer, instead of the loving eye of the urban chicken aficionado. These birds were pleasant, but not exactly earning their keep. Daily care, monthly feed-store runs, quarterly coop relocations, full-time housesitters when we left town — all for a mere three eggs a week? Yes, the eggs (when we got them) were fabulous, but we were still buying at least a dozen eggs a week at the store or the farmers' market. In addition, our family had expanded in 2009 from two adults, one cat, and three chickens to include a baby. As anyone who's tried to add kiddos into a home already populated with pets knows, the arrival of the small humans is a serious demotion for the non-humans. Some people deal with their suddenly too-demanding fauna by giving them away. Other, less responsible people abandon their animals. We decided on a third option: slaughtering them. I admit that we would never consider DIY slaughter for our cat, or for a dog if we had one. But cats and dogs generally live in the home. They sleep on your furniture. They cuddle up and, until they grow very old, are continent indoors. Chickens do none of these things. They are amusing and interesting, but, for us, they were always egg-layers, not pets. My husband and I had discussed whether we would kill our birds when it seemed like their egg-laying days were over. We had, ahem, chickened out of this with our roosters, taking them instead to a local small-scale processor. But for our hens, who had lived with us for two and a half years, my husband was adamant: He wanted to do it himself. Of course, as with all things baby-related, the scheduling didn't quite work out as planned, and the baby's nap interfered with the execution hour. So our friends gamely pitched in with my husband, while I fussed over the tot. Naptime over, the baby and I went outside to discover no more Stevie, Tuffy, or Snoop. Just three carcasses, getting plucked and dressed. Total time, including prep, slaughter, butcher, and clean-up? Four hours, which we figured wasn't bad for novice chicken-killers. We'd talked to friends who'd done it before; older hens are harder to kill, they'd warned, because the birds are tougher and have more fat on them. 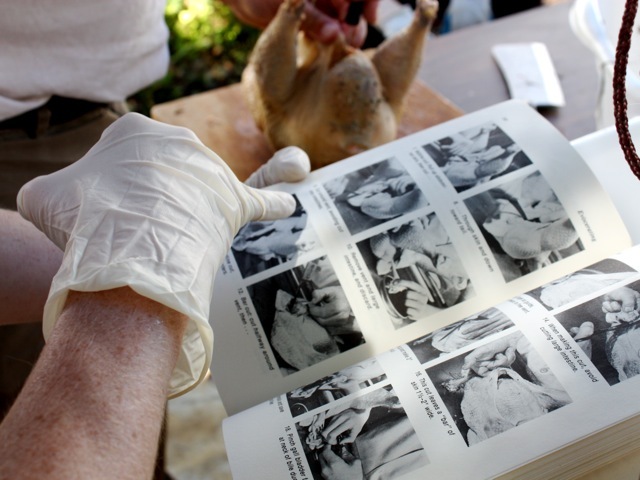 We'd looked at chicken-keeping websites and bookmarked the slaughtering sections of our chicken-keeping books. We had buckets, tarps, gloves, sharp knives, cutting boards, bleach, and hot water (with a little dish soap in it) for scalding the feathers off the birds. We had a bright-orange construction cone to use as a killing cone, C-clamped to a table outdoors. And we had determination. My husband was sad afterward, but not during. He said thank you to each bird in turn, and managed to kill them quickly (although not as quickly as he would've liked) and without too much blood. Their eyelids, which close up instead of down, shut as they died. 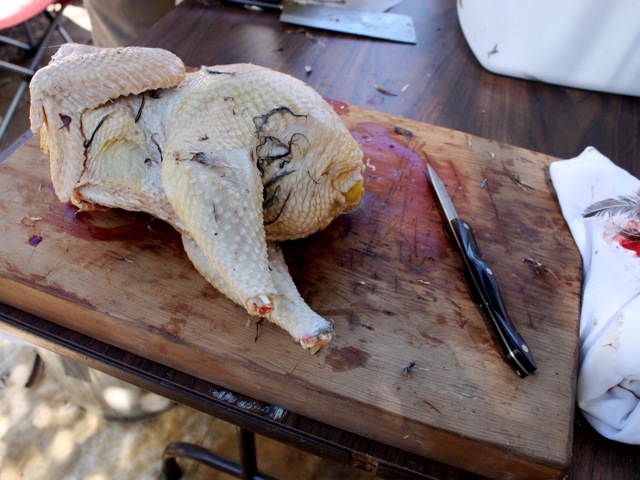 The plucking was easier than we'd feared; the butchering was trickier. As one of our friends muttered, "Joel Salatin made this all look so easy in 'Food, Inc.'" Making the evisceration process more confusing were the unexpected ova — ranging from yolks to one fully finished egg, ready to be laid — waiting inside Tuffy and Snoop. ("Girls, girls," I exclaimed, "why didn't you lay these eggs more often?") By noon, the birds were done, bagged and chilled, ready to go into the chest freezer in our basement. What happens next? Some weekend this fall, we'll put them on the stove and turn them into stock. And each time we cook thereafter, we'll say thank you all over again.